From Brantford’s downtown the Grand River meanders lazily, coming back on itself through a large ox-box, before reaching the tiny community of Newport. Just past Newport the south shore of the Grand River forms the boundary of the Six Nations reserve. From Newport the Grand River next flows through the town of Onondaga, and just a few kilometers past that, the river flows past a large white house on a hill. This is Chiefswood. George Henry Martin Johnson, a Mohawk chief, constructed the house from1853 to 1856 using walnut trees from the surrounding area, as a present for his English-born wife, Emily Susanna Howells. The impressive home has two “front doors” – one facing the river welcoming those traveling by canoe, and another facing the road. These two doors are key to the original function of Chiefswood and its significance today. George Johnson’s family and Chiefswood represented a bridge between the two worlds of the Six Nations, and white settlers and authorities. George Johnson’s grand-father Jacob was born in the Six Nations’ traditional territory in Upper New York State. 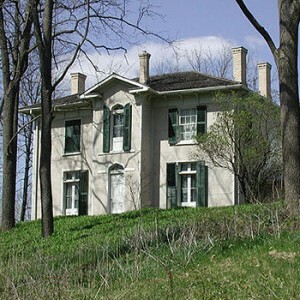 After the American Revolution and the destruction of Six Nations’ villages, Jacob followed Joseph Brant to the Haldimand Tract, the land on either side of the Grand River granted to the Six Nations’ by the British Crown in recognition of their loyalty during the American Revolution and in compensation for their lost lands. George Johnson’s father, John “Smoke” Johnson, was born in the Haldimand Tract just outside of what would become Brantford. Smoke Johnson fought in support of the British in the War of 1812, and became an influential figure in both the Six Nations’ community as well as neighbouring white settler communities. Like his father, George Johnson also acted as an intermediary between the Six Nations’ and white settlers and authorities. Fluent in Mohawk and English George worked as an interpreter for the Anglican mission on the reserve and later for the British Government. With his marriage to English-born Emily Howells, George and his family bridged the two worlds. Chiefswood was a physical bridge between the two worlds. Here members of the Six Nations landed their canoes to visit and seek assistance or advice from Chief George Johnson. Here also white settlers and government representatives stopped from their travels on the road to meet with George Johnson and gain his valuable services as a diplomat and interpreter between the two communities. Chiefswood is also significant as the birthplace and childhood home of E. Pauline Johnson. Pauline Johnson came to fame across Canada, the United States and England as a writer and performer in the late nineteenth and early twentieth century. Pauline Johnson was proud of her Six Nations’ heritage proclaiming, “My aim, my joy, my pride, is to sing the glories of my own people.” Yet Pauline was aware of her mixed heritage and her ability to bridge the two worlds through her art. 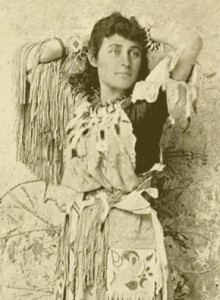 During her stage performances Pauline would alternate between her “native” dress of buckskin and bear-tooth, and fashionable “English” dress. Pauline retired from the stage to Vancouver, and died in 1913 from cancer. Her ashes were buried in Stanley Park where a monument to her still stands today. Chiefswood still stands today as a testament to the Johnson family and their roles as intermediaries between Aboriginal and non-Aboriginal cultures and communities. Recognized as a National Historic Site since 1953, Chiefswood has operated as a museum since 1997. While the site was damaged by water from frozen pipes last winter, it will soon open again soon to share its unique history as a bridge between two worlds.